Admiral Markets is an online brokerage company, founded in 2001 and owned by Admiral Markets Group S.A., a holding company based in Estonia. It is one of the brokers regulated by many public agencies like FCA and ASIC and it managed to build a reputation as a reliable broker that manages to offer a wide variety of trading services to its clients. • MT5, an account designed specifically for the metatrader 5 platform. Admiral Markets offers trading services for traders who need to make a minimum initial deposit of 200$, which is affordable enough. Admiral Markets relies mainly on the metatrader 4 platform and even managed to develop its own version of mt4 called the Supreme Edition. A new collection of indicators like candle countdown, chart group, freehand drawing and renko charts. 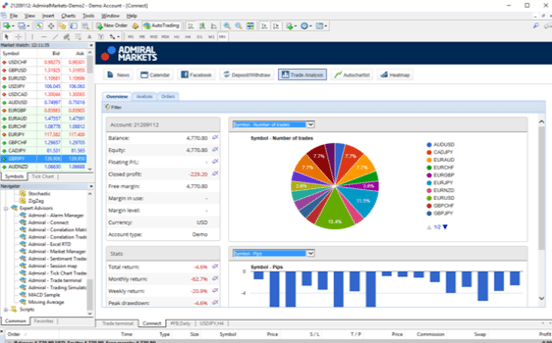 Admiral Markets also offer a web version of mt4 and also iOS and Android apps, which could be downloaded from their website or app store/google play. The company also excels when it comes to educational material. They regularly invite top analysts and people from the field of trading and hold free webinars for those that are eager to learn more about how to trade the markets. When it comes to customer support, Admiral Markets stands out in huge way. They have offices in a wide variety of countries and their clients get support in the local language, so a huge advantage for those who do not know English very well. They have live chat, email and phone support, from Monday to Friday. Summary: Admiral Markets is an online brokerage company, founded in 2001 and owned by Admiral Markets Group S.A., a holding company based in Estonia. It is one of the brokers regulated by many public agencies like FCA and ASIC and it managed to build a reputation as a reliable broker that manages to offer a wide variety of trading services to its clients.